If you're anything like most people, you can probably rattle off 100 different things you'd rather do than dig through your inbox. It starts to feel like a chore, because what's in there isn't very interesting. In fact, only 21% of consumers reported that they've received a memorable promotional email in the past two months, according to a study by Litmus. To overcome that, many brands are using email personalization as a strategy for creating more engaging email experiences -- ones that feel less like a robot, and more like a friend. The best part? Email personalization doesn't need to be insanely complicated to resonate with recipients. 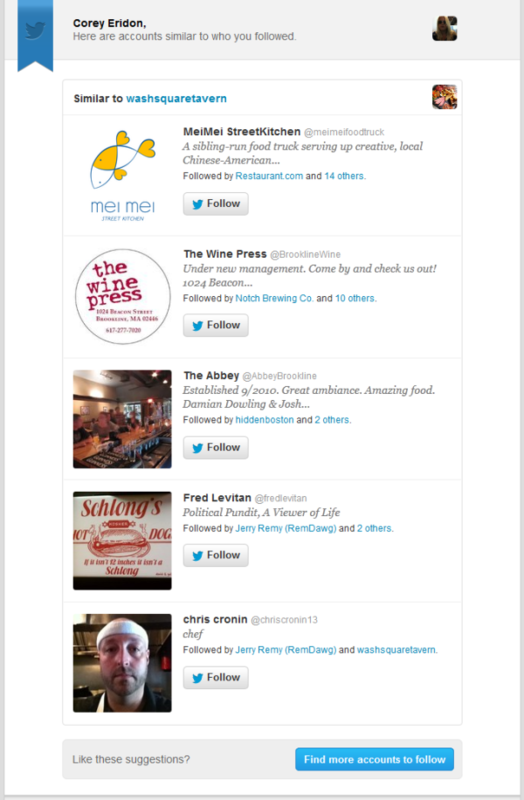 To see what I mean, check out these 13 great email examples that cleverly use personalization. As you may have gathered from my bio, there are few things in life that bring me as much joy as a remarkable meal. That's why OpenTable is one of my favorite brands. Not only does it easy to make reservations online, but it also remembers my favorite restaurants, and helps me discover new ones based on my reviews and reservation behavior. One way OpenTable encourages me to leave reviews is by sending me an email with a personalized subject line asking me how my most recent meal was that I booked through this platform. 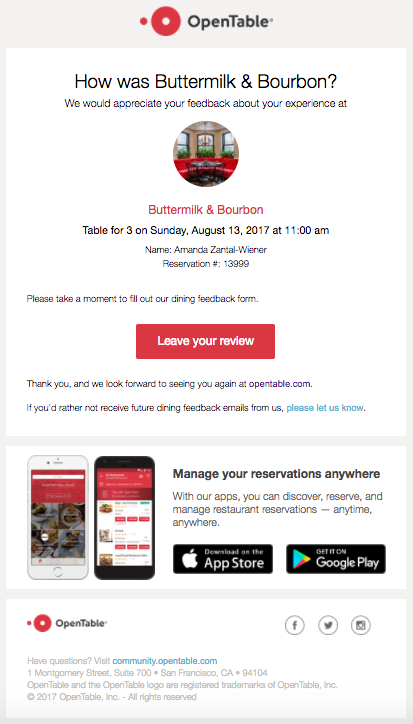 Because these reviews help OpenTable figure out which restaurant recommendations to make for me, I'm already encouraged -- but a personalized, specific subject line with a reminder of where my last reservation was, helps to boost my engagement. Oh, JetBlue. You shouldn't have. This anniversary email highlights a creative example of a brand using something as simple as a date to provide a standout experience. Much like a birthday shout out, JetBlue used my colleague's account creation date to trigger a personalized email to celebrate the fact that they've been "emailing for 365 days now." If you're a HubSpot customer, this is an easy email to replicate for your contacts through a fixed date or property-based workflows. It allows you to base your workflow on a calendar or contact property date, so you can send anniversary emails, digital birthday cards, renewal reminders, and more. And if your business is sending a high volume of these emails, we also offer the Transactional Email Add-On. Here's another great personalized email example that leverages a user's interests to provide a relevant, value-packed message. The copy in this email from Spotify is particularly effective because it frames the personalization in a way that makes the recipient feel like they're being rewarded for their usage. Phrases like "top listener" and "be the first to get access" lend themselves to a sense of exclusivity -- making the user feel important. 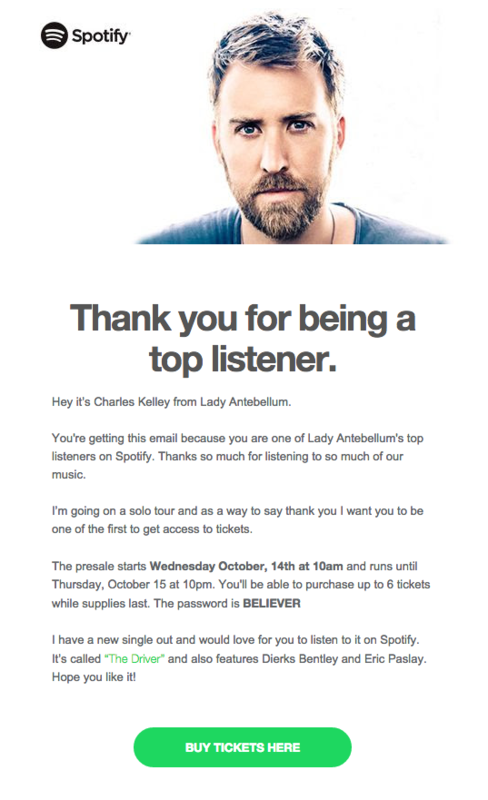 The email also closes with a written call-to-action that encourages the recipient to listen to Charles Kelley's new song -- specifically on Spotify. Again, this push helps to ensure that the user is actively using the streaming service, and therefore continuously reminded of the value. A few Halloweens ago, HubSpot's blogging team dressed as the dancing pumpkin man from this viral video. (And, in case you're wondering, we dressed as a bunch of bananas last year.) But before opting to DIY our own orange masks, my colleague, Lindsay Kolowich, set out on an Amazon search to find us the real deal. This email serves as a great example of how to use a contact's search behavior to re-engage them with your company, and hopefully move them closer to a sale. 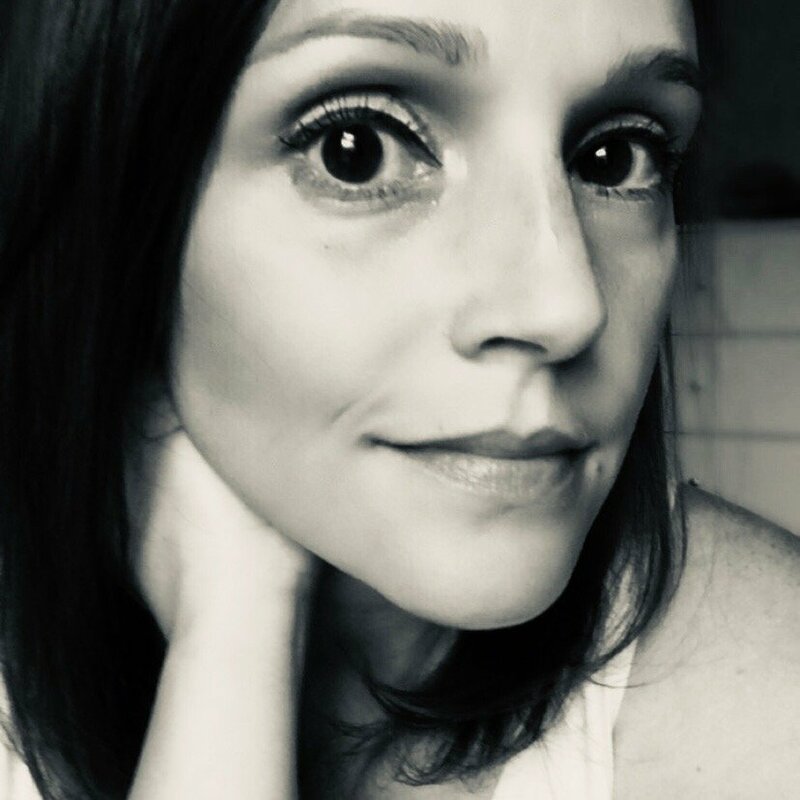 Once upon a time, before I worked for HubSpot -- practically another lifetime, it feels like -- I was about to graduate from business school and actively applying for jobs. I often used LinkedIn for my search -- a business-focused social network that was paying attention the type of listings I responded to. Each day, LinkedIn sent me a roundup jobs it thought would pique my interest. What's interesting about this email is that LinkedIn wasn't using it to earn my paid business. Rather, LinkedIn seemed to be keeping a close eye, algorithmically, to the locations and type of work I was seeking. While some of the listings were more applicable than others, all of them were clickable. Did you catch that? Clickable. 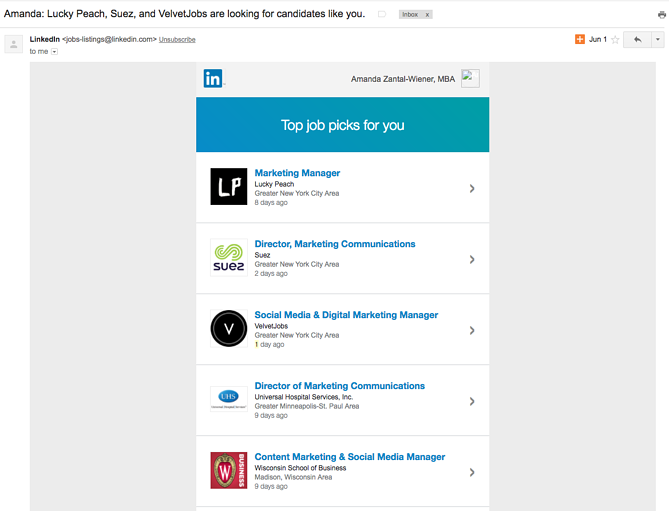 And even if none of these jobs piqued my interest, I had about 250 classmates who might have considered them, driving even more traffic to LinkedIn's website. 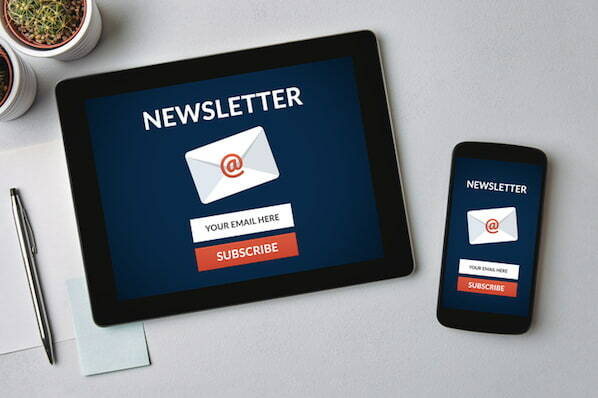 So think about what's going to make your content clickable, and how you can use personalized emails to drive traffic to your site. Then, set up workflows that remind subscribers how to continue taking advantage of these specially-tailored messages. I received this email back when I was living in New York address, but it still serves as a great example of how to use location information to provide a customized email experience. 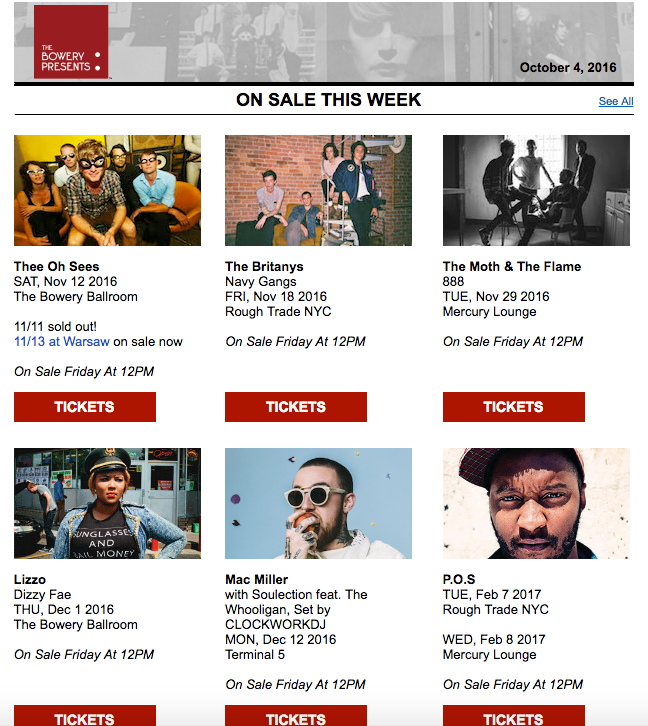 In the email, The Bowery Presents pulled shows from New York venues -- where I purchased tickets for many events when I lived there -- for artists similar to the ones I saw live. And when I finally purchased tickets to see one of these artists in Boston? 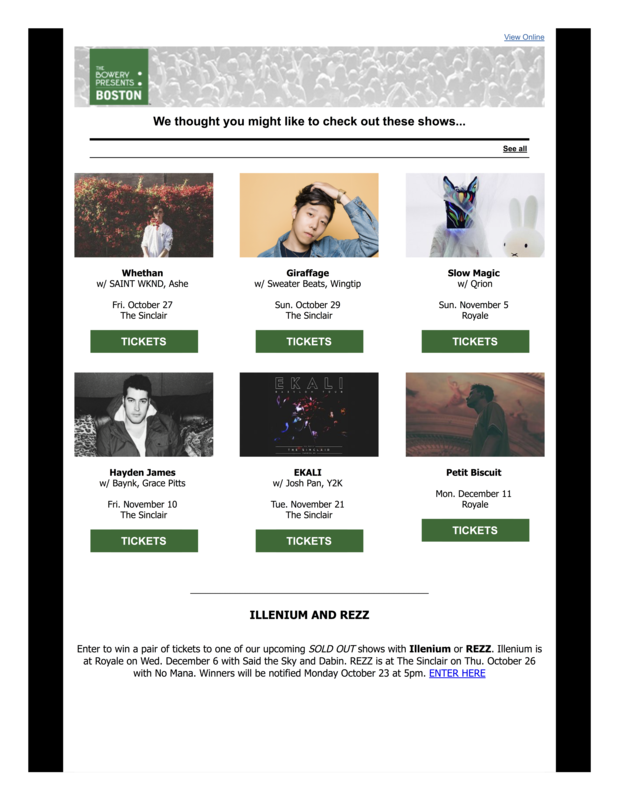 It re-personalized my emails to let me know about shows here. By making it easy for me to quickly visualize what's headed to the area and when, The Bowery Presents is able to lower the barrier between me and the point of purchase. This type of personalization could be extremely beneficial for a company looking to deliver more relevant messages to international leads or existing customers. 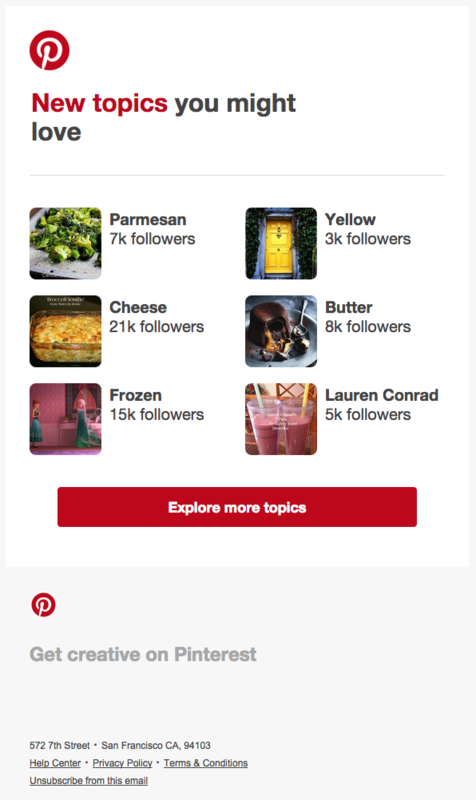 After following one of her favorite brunch spots on Twitter, my colleague Corey Wainwright received this email from the social network with suggestions for similar accounts to follow. When companies have as much data as Twitter does, they usually go one of two ways with personalization: They totally hit the nail on the head, or they have too much data to sift out what's important. This is an example of accurately identifying what Corey would actually care about, and delivering it to her. There are few places on the planet that I love more than Hawaii. I'm constantly thinking about my next trip there, but for a while, could never quite commit to booking it. 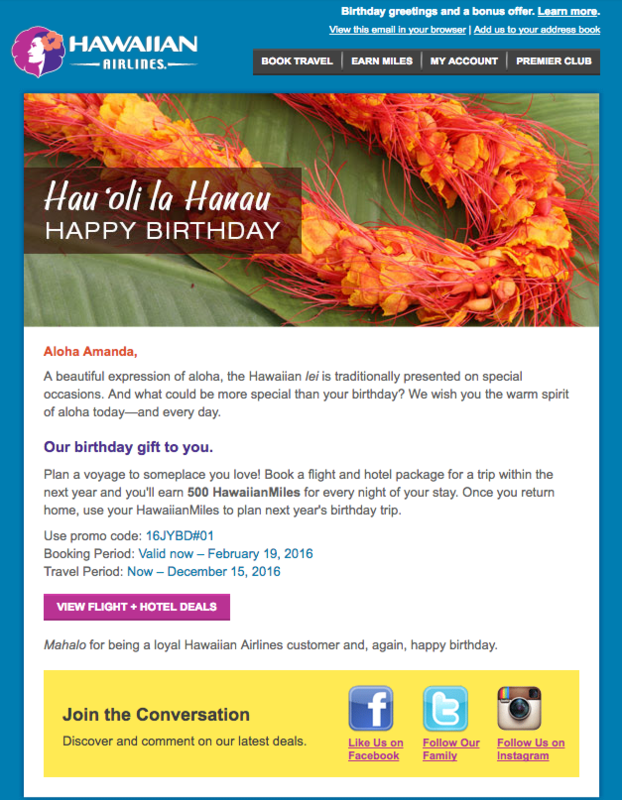 That is, until I received this special birthday email from Hawaiian Airlines. In keeping with the Hawaiian tradition of presenting someone with a lei on his or her birthday, the airline instead chose to present me with 500 bonus miles, just for booking a trip within the next year. Aloha, indeed. There's more than one noteworthy thing about this email. First, the only reason I received it is that I'm enrolled in the Hawaiian Airlines mileage program, and getting emails like these is just one of the "rewards" of membership. Plus, the airline understands that I joined for a reason -- because at some point, I planned to visit Hawaii again. With that in mind, Hawaiian Airlines used this personalized email to give me an incentive to finally book that trip, with a birthday greeting to boot. That's a great way for brands to achieve customer reactivation -- by using a fixed date, like a birthday or anniversary, to remind people what it was that they loved about your business in the first place. By offering something special from your brand to commemorate the occasion, you're giving your audience the motivation to take action and making a purchase. There's a thing about licenses and certifications. They're valuable. They help you master knowledge and become an expert. Having them makes you look good. But they also have to be kept up-to-date, and unless you're reminded, letting them expire can be all too easy. If you have any HubSpot certifications, you know that doesn't have to be the case. 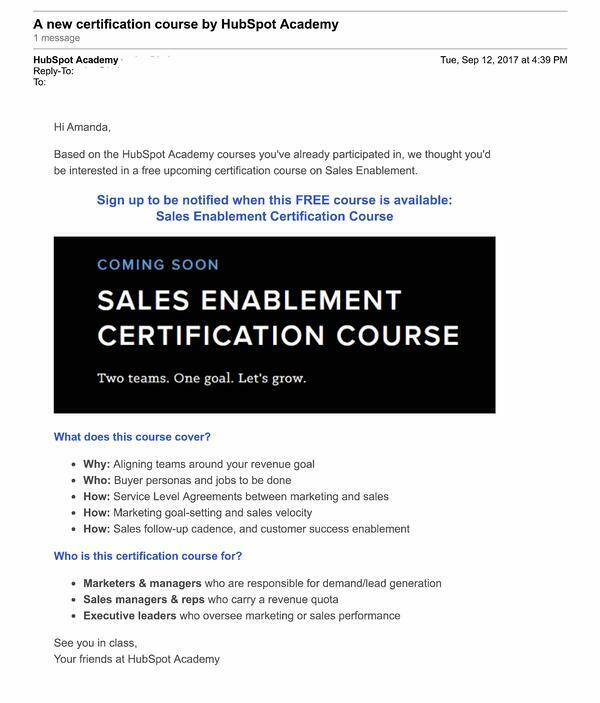 Our Academy team creates personalized emails to let certification-holders know which ones they currently possess, which ones need to be renewed, which ones might be helpful to add to their credentials, and when new certifications are available. 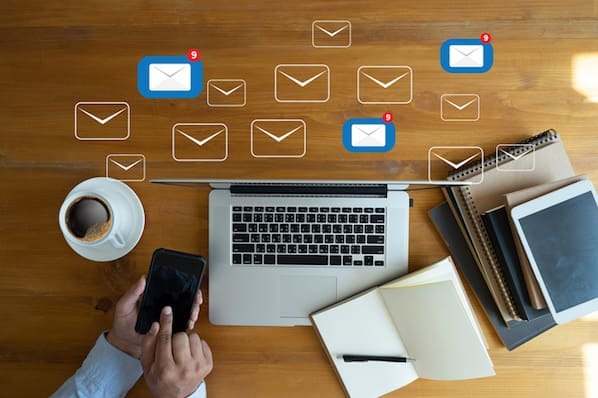 Eric Peters, the senior growth marketing manager with HubSpot Academy, explained the technology that makes emails like these work. Each certification box in the above email is made "smart," to show users which certifications are available to them. "All nine certifications are available to partners. Eight are available to customers, and four to non-customers," Peters says. "Each one of those certifications has a Smart CTA that appears as a different color, depending on whether the user is actively certified -- which means they passed within the last 395 days -- expired, or incomplete." "In other words," he explains, "it's a bunch of Smart CTAs embedded in a smart rich text box. The CTAs point to the splash page describing the certification." Am I the only one that spends more time looking for a movie on Netflix than I do actually watching it? 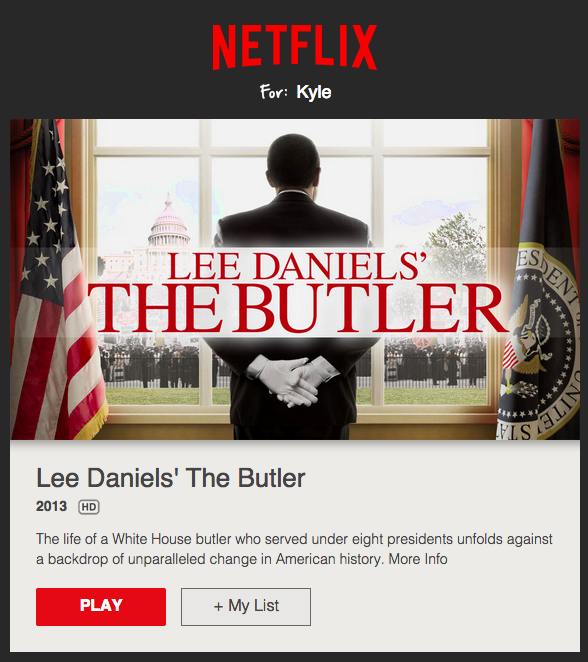 By providing a custom recommendation, Netflix helps ensure that users are actively seeing the value of their subscription. In other words, it keeps them watching, which ultimately keeps them paying. This approach could be applied to a number of marketing materials -- ebooks, webinars, and blog articles, to name a few. For example, if you find that someone downloaded an ebook on social media tips, you may want to set up a workflow to trigger a follow-up email that suggests they check out your social media guide on SlideShare. And given that, at the time, she was planning a yellow-themed wedding, I'd say the results were pretty accurate. What we love most about the email is its simplicity. It offers up just six topics, which is enough to interest the recipient without overwhelming her. Plus, the copy is quick, friendly, and clear. In other wedding-related news, Mineo also received this email example from WeddingWire, an online marketplace for venues, cakes, dresses, and other wedding-planning items. While the copy was clever in and of itself, what really struck us was the personalization used in the subject line. After all, your recipients aren't going to see the content unless you persuade them to click first, right? 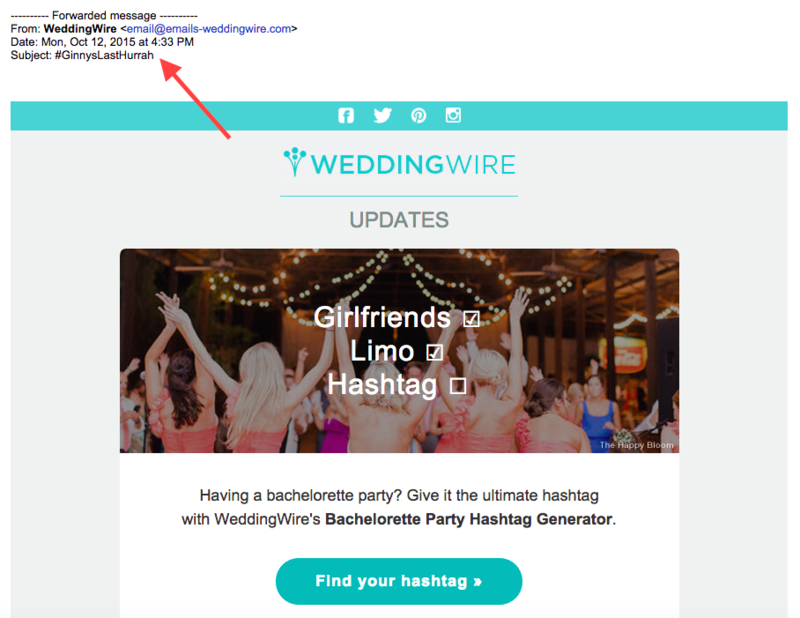 By using a witty, custom hashtag -- #GinnysLastHurrah -- in the subject line, WeddingWire inspired her to click on the email, check out their tool for creating hashtags, and forward the email to the rest of us. If you want to boost the word-of-mouth influence behind your product or service, you should consider how personalization can help propel your message. Birchbox is a company that's fixated on personalization in all the right ways -- and all it takes is one glance at the header of this email to see why it's effective. Birchbox transparently admitted that they took a peek at my colleague Carly Stec's sample and purchase history before crafting this email. That gave her the sense that what came next would likely be relevant to her -- and it was. These little, personalized messages always reinforce why Carly continues to subscribe to the Birchbox service -- they strengthen her loyalty. With 62% of millennials feeling that online content drives their loyalty to a brand, and 46% of U.S. consumers admitting that they’re more likely to switch providers than they were 10 years ago -- it's clear that fostering loyalty through personalization should be a priority. It may seem like a big undertaking, but by observing, understanding, and investing in the behavior of your customers, you can help to ensure that they'll stay customers. So start getting personal -- and building loyalty.